Our range of products include lubricating herbal eye drops, herbal eye drops (sritone), herbal eye drops, herbal wax softening ear drops, eye drop and herbal eye drop. Tears that lubricate the eye are produced round the clock and they have an important everyday function. A film of tears, spread over the eye by a blink makes the surface of the eye smooth and optically clear. Without the tear film good vision will not be possible. 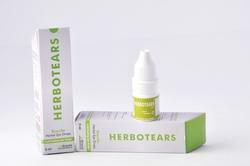 Herbotears eye drops are also known as 'artificial tears' and are used in the eye to relieve dryness and irritation caused by a reduced flow of tears. In certain circumstances they can cause damage to the eye. Herbotears can also be used as a lubricant by producing artificial tears to the eyes and to moisten hard contact lenses. Application of artificial tears every few hours can provide temporary relief from the symptoms of dry eyes. 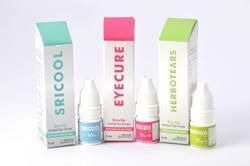 Herbotears stabilizes and thickens the precorneal tear film and prolongs the tear film breakup time. Replacing natural tears with artificial tears is the basis of treatment. Artificial tears lubricate the eyes and replace the missing moisture. 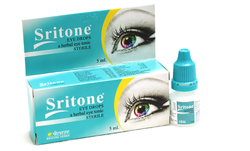 Sritone eye tonic ia a powerful anticeptic solution providing cooling soothing effect on eyes without any side effects on eye tissue.Sritone eye tonic is useful in case of conjunctivitis, trachoma, blepharitis, keratitis, corneal ulcers, lenticular opacity, myopia, hypermetropia, dacryocystitis etc. 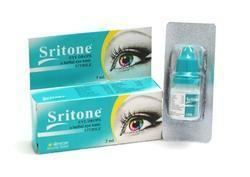 Sritone eye tonic helps in controlling cataract, improves vision and prolonged use helps keeping eyes healthy. For those who suffer with night blindness, vision issues that are worsened by computer screens or fluorescent lights, or those who experience focus issues when lighting changes abruptly. This eye tonic help those who experience indoor/outdoor light adjustment, and it acts as a great general tonic for the eyes. If you spend lots of time staring at a computer screen and notice that your eyes seem tired, tense, foggy, or slow to respond. A complete herbal solution for your eye problems. Sricool is a unique formulation based on the principles of ayurveda, that will help you counter any kind of eye related problem. It is the safest method to rejuvenate the vision of eye. Sricool is an ayurvedic preparation, free from harmful chemicals that work as an antiseptic and non-irritant lotion without any harmful effect to the eye tissues. strain in eyes due to computer fatigue/ long hours of driving etc. Dosage: 1 to 2 drops to be applied in both the eyes at frequent intervals during long hours of sitting on computers, reading, driving or any other activity which involves continuous use of eyes. We offer wax softening ear drops sofherb. 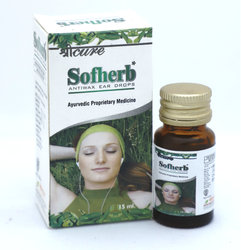 Sofherb is a herbal formulation to soothe and reduce the painful effects of earaches. Ear wax is a normal secretion of the ear. It is produced to provide a protective layer in the ear and on the ear drum. There are times when too much wax is produced. This can result hearing difficulties and may cause pain. Sofherb is used to decrease lymphatic swelling associated with congestion and infection. A hard plug of wax can be softened using sofherb ear drops. A few drops of sofherb ear drops regularly applied, prevent an excessive formation of ear-wax and assure the ear a correct preventive hygiene. This product is ideal for improving ear care in children, adults and wearers of hearing prosthesis as they do not dry up the skin and disturb the natural sebaceous physiological balance. sensation that you are spinning even when you are standing still. Dosage: 4 drops in ear 3 times daily or as needed for symptomatic relief of earache pain. May be massaged behind the ear and down the neck to encourage fluid drainage. Directions for use: bend your head and pour 3-5 drops of sofherb ear drops into the ear. Pay attention not to insert the dropping bottle into the ear. Allow the drops to act for at least 15-20 minutes by holding your head bent or by putting some cotton wool within the ear. Then gently clean the auricle. It is advised to treat both ears at a time. If earache continues for more than two days or becomes severe, consultation with a qualified healthcare professional is strongly recommended.